Telenetics introduces the latest addition to the family of industrial grade, temperature hardened Modems, Model Motorola MOT202T Modem. This 0-1800 bps leased telecom line or private wire modem is a pin-for-pin, form, fit and function replacement for the Motorola RM16M 202T modem. 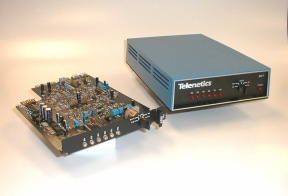 Telenetics recently signed a manufacturing license with Motorola and we are now delivering this new product line. Telenetics had to change some of the older chips for newer analog filters which gives new life to a world class modem. With these new changes we can offer an even a better unit - now with wider voltage and temperature range.